I'm no expert in the kitchen. I've only got a few dishes that I can confidently serve to people who are not family members. I go for simple and easy to prepare dishes. Most (if not all) of my limited specialty are cooked in the oven. My oven-baked ribs, salmon in lemon butter sauce, and rosemary chicken are usually served during special occasions and family gatherings. They are best enjoyed with a steaming bowl of rice. While most Filipinos are used to eating rice variants like Sinandomeng or Dinorado, Harvester's Gold Premium Sticky Rice is also another great everyday rice. It compliments tasty Chinese, Korean, Japanese and Filipino dishes. 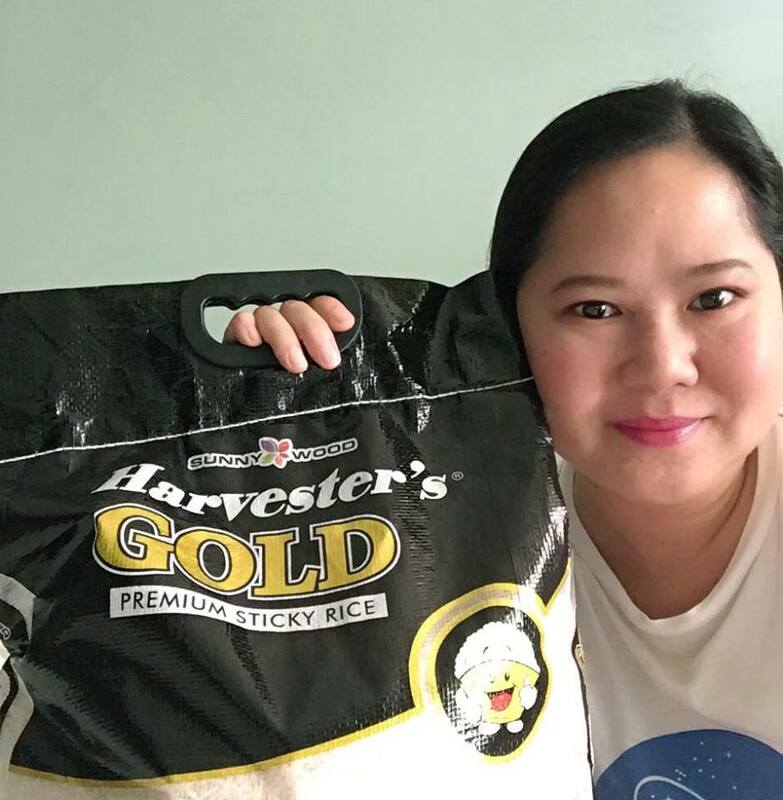 The Harvester's Gold Premium Sticky Rice is slighty sticky and has a subtle, natural, aromatic scent. If you love maki roll as much as I do, this is the perfect rice to use. 1. Cook the Harvester's Gold Premium Sticky Rice in advance. You won't be able to roll it if it's newly cooked because it's too hot. 2. Prepare the ingredients you want to put in your maki roll. You can have crabstick, cucumber, scrambled egg, salmon, avocado. It's whatever you really fancy. 3. You can either put the rice on top of the nori or have the nori inside like what I did on the photo. It is actually easier to do the former. Put the ingredients on the center creating a horizontal line. Add Japanese mayonnaise. 4. Carefully roll the maki from the bottom edge going up and make the ends stick together. 5. Cut the roll in mouth size so that it's easier to eat. The reason why I didn't have it nori-wrapped was because I want my maki rolled on a generous amount of fish roe. 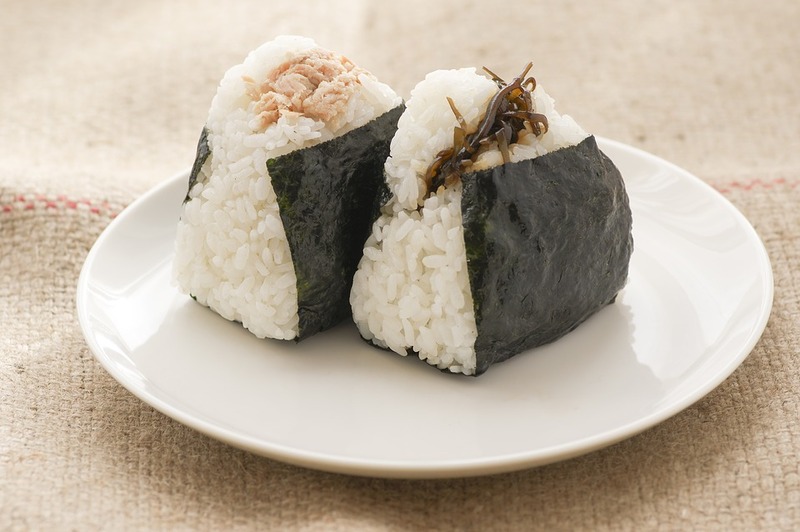 Onigiri or Japanese rice balls is simply made from steamed sticky rice that is formed into triangular shape and wrapped with nori. My version is not the traditional Japanese rice ball that is filled with pickled ume fruit (umeboshi), bonito flakes, or tsukudani. I just look for anything available in the pantry like spam, tuna with mayonnaise, and even stuff it with leftover tempura or quick-fried beef. I make onigiri when I just really want to be fancy with whatever I can find in the kitchen. Filipinos have breakfast food and fried rice is a staple. Well, if there's a leftover rice from dinner there's no better use for it than to prepare fried rice or sinangag. While the Pinoy version is simply frying the leftover rice with crunchy garlic, the Japanese fried rice is a meal in itself. I would usually put strips of beef tapa, sliced scrambled egg, scallions, and a dash of Japanese soy sauce. If you love spicy, you can make kimchi fried rice. Saute onion and garlic. Stir in chopped kimchi and sliced green bell pepper. Add in the leftover sticky rice. Top with sunny side up egg. Wash the rice in normal temperature water. Repeat until the water is almost clear. When cooked, allow the rice to absorb the moisture in the cooker before opening or removing the cover. Wow,mukhang easy lang gumawa ng maki,may video po ba kayo non?gusto ko rin itry po yung japanese fried rice pra level up nman ang sinangag namin�� how much po per kilo nyang sticky rice? madali lang nga gumawa. kaya siguro madami din napapansin ko nag start mag business ng mga maki. P420 ang 5 kilos sa grocery.